Motherwell manager Stephen Robinson has revealed his delight at finally signing Burundi midfielder Gael Bigirimana. The 23-year-old, who had a loan spell at Rangers from Newcastle in 2015, signed a two-year deal at Fir Park after deciding to leave Coventry City. "He's another who we have had several attempts at recruiting; it's a big coup for us to get Gael here," Robinson told the club website. "He showed a real hunger and desire to come and play with us." Bigirimana started his career at Coventry before Newcastle paid for his signature in 2012. 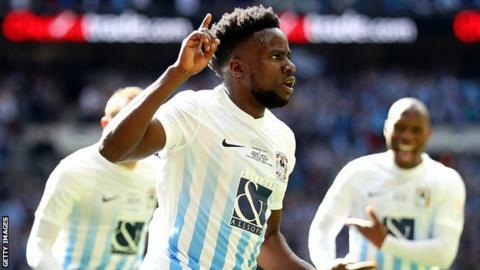 After a loan spell at Rangers, during which he did not feature for the first team, he returned to Coventry on loan before formalising a switch to City. The midfielder was the club's player of the year last season and Robinson is excited to see what he will bring to the Steelmen. "He brings a real composure to the midfield, something that perhaps we've missed, someone to dictate and run the game," the manager said. "He certainly provides that, but he also brings energy and a vast amount of experience at a good level for such a young guy." Bigirimana told the Well website: "I know Motherwell has a great history and I look forward to pulling on the top. "I've met the manager before when he was at Oldham and I was playing for Coventry, I had a really good game and afterwards he came up to me and told me that but I told him it wasn't even my best yet." The Burundi international became Motherwell's second capture of the summer following the signing of striker Alex Fisher from relegated Inverness Caledonian Thistle. "His stats in terms of how he finished the season, eight goals in nine games, speaks for itself," Robinson said of Fisher. "However, what impressed me very much was the different type of goals that he scored. He's played in the Scottish Premiership, so is familiar with the league, and will give us height and strength in attack." Overall, Robinson is more than happy with his summer recruitment so far. "We aren't able to offer the best wages about, but what we did is sell a vision of what we want to do and the togetherness we want to bring to the football club," he added.